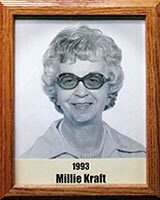 Millie Kraft started bowling in 1948. One of her first and proudest undertakings was starting the Junior League in 1952 at Speedway Lanes (later Kegler Lanes). From its modest beginning of 40 youths, Tucson has over 1,000 youngsters enjoying the sport of bowling today. Millie bowled in 30 consecutive WIBC tournaments and helped run the tournament. She participated in all the Tucson City Tournaments and helped run the tournament. She was a charter member of the TWBA and the AWBA, both of which have honored her by her induction into their Halls of Fame. Millie served on the board of the AWBA and TWBA and served 20 years on the board of the National Women Bowling Writers. She received the AMF Helen Duval Award for Outstanding Service to Junior Bowling and the Mary Janetto Award for Outstanding NWBW member, of which she was a member emeritus. She also was the first editor of the Tucson Ten Pins Hits. Millie believed in giving recognition for service. She made it possible for the Arizona Women Bowling Writers to honor someone each year for their contributions to junior bowling. The Millie Kraft Award is presented each year at the AWBA meeting. When the Professional Bowlers Association came to Tucson, she volunteered to help. She was the recipient of countless awards and honors. The Pepsi-Cola-sponsored tournament was named the Millie Kraft Junior Pro-Am in honor of her service to junior bowling.